The collapse of a pedestrian bridge in Miami made national news last year when it killed six people. Now, according to NBC 2, the contractor behind the project, Munilla Construction Management (MCM), has filed for Chapter 11 in federal court. This filing will protect the company as it tries to rework its debts. Ultimately, some debtors might end up having to accept less than what they are owed. A report released in November 2018 identified design flaws as the reason the bridge at Florida International University collapsed. According to the report, these flaws did not properly estimate the strength of a section of the bridge. There were also cracks in the bridge that showed up in the weeks preceding the collapse, though investigators have not yet determined whether the cracks are in any way tied to the ultimate failure of the structure. The bridge was designed by FIGG Bridge Group and not by MCM. Munilla Construction Management has won many government contracts over the years and is a family owned company. According to the Chicago Tribune, MCM has won roughly $70 million in construction contracts since 2014. The FIU bridge collapsed on March 15, 2018. A spokesperson for the company has said that the filing of the lawsuit is not an attempt to avoid legal responsibility for those injured or killed in the collapse. By filing for bankruptcy, the automatic stay prevents any new claims from being filed against Munilla. Nevertheless, MCM has said that it will negotiate claims filed against the company from survivors of the bridge collapse. The company has struggled in the past year. MCM has abandoned several bids for construction projects over since the collapse, including an $800 million contract for a new signature bridge over I-395. According to the company, it has not been able to make a bid in the past nine months. By filing for Chapter 11 protection, MCM can continue to operate while it tries to rejuggle its debts. According to the company’s president, MCM has its doors “open” for new business and has obtained financing to finish current construction contracts. Had the company filed Chapter 7, then it would have needed to liquidate. It also might have been able to wipe out any lawsuits against the company. By filing for Chapter 11, MCM is signaling that it intends to be doing business into the future. 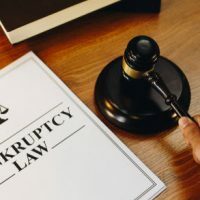 If your company is struggling with debt, then a business bankruptcy might be just the ticket you need to get creditors off your back. You can eliminate or reduce current debts and keep your business going if you want. You might even be able to eliminate lawsuits against your company. At Nowack & Olson, we have worked with several small and family businesses to help them choose a path forward, and we are available to talk with you. Please contact us today. You can call 888-813-4737 to schedule a free initial consultation.